When looking for a unique or unusual floor choice, the range of options seems to be expanding at a dizzying rate. 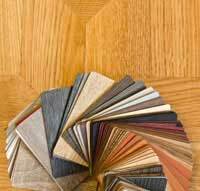 Along with increasing options for concrete–stained, painted, stamped and more–and an expanding palette of exotic hardwood flooring choices, there are also some more unique materials being used in flooring situations. Some are just unique uses of materials that are fairly readily available, including paper, leather, glass, cork, metal and bamboo. Others are technology going underfoot, like “liquid” or LED panels. 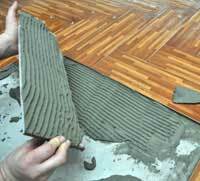 Then there are flooring applications that are slightly more unusual–bone, coins, bottle caps and other choices limited only by imagination and the determination to find an adequate way to install the flooring for use. However, every floor is only as durable as the tolerance of each component of the entire flooring system. Moisture is one of the realities that must be managed both within the material itself and from external sources that can impact the overall moisture condition. Sealants protect the surface of flooring materials during use from scuffs, foot traffic, furniture wear, moisture (either ambient moisture or water that is in direct contact) and other surface realities, but each flooring material can also be susceptible to moisture from below, either through direct water sources like leaking plumbing, or from the subfloor materials. While each unusual flooring choice represents the desire of the owner to have something unique or expressive of their tastes, each and every floor has something in common. Even the most exotic flooring is usually installed over a traditional subfloor of either concrete or wood. Moisture-related flooring problems cause millions of dollars of damage each year, and yet they can also be some of the most preventable problems with a few simple precautions at the planning stage. It’s already been pointed out that most subfloors consist of either concrete or wood, and each has unique realities that must be allowed for when it comes to its relationship with moisture. 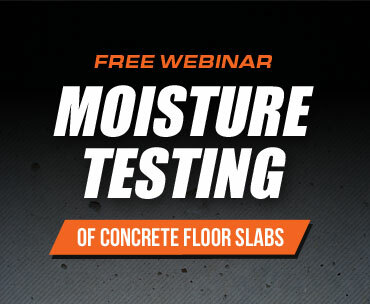 As durable as concrete is, concrete is never in a truly static state when it comes to moisture. A drying slab has a moisture gradient that means moisture is more condensed (or higher) at the bottom of the slab and beneath it (or has less moisture in a given area) at the surface. This is because evaporation is the key mechanism behind the concrete’s drying process. As moisture from the initial concrete mix evaporates away from the surface, more moisture is drawn up to the surface through the natural capillaries of the concrete where it, too, can evaporate away. This process is affected by the ambient relative humidity (RH) of the air surrounding the slab. If the RH is high, it cannot “hold” as much water and the evaporation process will be slowed. If the ambient RH is higher than the moisture levels in the slab, the concrete will actually absorb some of the moisture from the air. This process isn’t only true for drying concrete. Bring an existing slab into contact with a moisture source (a substandard vapor barrier, leaking plumbing, groundwater) and it, too, will absorb moisture that may adversely affect the flooring system above it. For any type of flooring, if the slab’s moisture level is above the tolerance of the flooring material or the materials used to attach it to the slab, it will cause a myriad of problems including flaking, adhesive failure, discoloration, blistering, scaling and more. Wood can be used as a subfloor over a concrete slab or as a suspended subfloor system, like plywood over floor joists. Wood, like concrete, is in constant interaction with its environment and high moisture can also lead to problems with any applied flooring, including buckling, warping, discoloration, gapping, adhesive failure, fastener failure and more. Between each floor and subfloor is generally some type of attachment system, whether it includes nails, grout or adhesive. Each product will have a moisture tolerance too; the moisture level at which it can function as planned, or at which it will fail. 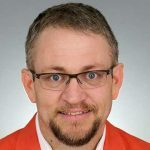 Particularly as products move towards more environmentally-friendly options, their ability to function under high moisture conditions can be limited. For most attachment methods, the prime source of excess moisture is the subfloor. The best way to prevent moisture-related moisture problems is with accurate moisture measurement of all layers of flooring before installation begins. 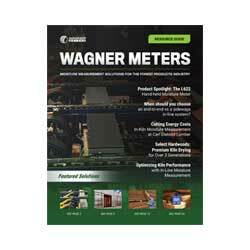 That’s where we at Wagner Meters can help. For wood subfloors, we provide a range of field-proven wood moisture meters to help correctly assess the moisture in both wooden subfloors and in wood-based flooring materials. We also provide a multi-material wood moisture meter to help measure moisture in a range of other materials. With accurate moisture testing, you can then make informed decisions about the correct adhesives, the installation schedule, and the finishing products necessary to make your one-of-a-kind floor stand the test of time. Don’t put your exotic or unusual floor choice at risk by ignoring the basics of moisture measurement.